Fun fact: This article is consistently in the top four or five visited pages on the Register. Thanks. Today, by most accounts, Phenix City, Alabama, is a nice place to live and work. Business Week magazine rated the city on the Chattahoochee River near Columbus, Georgia as the “Nation’s Best Affordable Suburb” in which to raise a family in 2007. Located not far from Fort Benning, the city of about 28,000 souls appears to be a quiet, decent, typical American small town. Perhaps it is unfair to include an entire community in the Malefactor’s Register, and even at its worst the vast majority of Phenix City citizens were decent law-abiding folk who just happened to tacitly condone a culture of vice that made Havana pale in comparison. Complicit but not culpable, most of the people who lived there during the worst of times thought themselves too powerless to make a difference. Chances are they were right. Until 1954, when the Alabama National Guard was called in to enforce limited martial law, there was a machine in place in Phenix City that didn’t blur the line between law and crime — it obliterated it. To get an idea of what the devolution of Phenix City must have been like, recall the movie It’s a Wonderful Life. Bedford Falls with George Bailey was a nice place where people could walk the streets at night and raise kids and all went to the same church. They took soup to sick neighbors and even the girl of questionable virtue had a heart of gold. In contrast, “Potterville,” the same city without George, was filled with bars, nightclubs, dance halls and worse. People walked the streets at night, but they were usually drunk, and if not, they were looking for love in all the wrong places — certainly not in church. People who are opposed to using casinos to inject much-needed capital into foundering municipalities can use Phenix City as a good example of what can go wrong when a community compromises its morals. Like many small towns during the Depression, Phenix City was struggling. The city literally had no money — in 1932 the teachers were paid with valueless scrip. Something had to change, and the city fathers decided that perhaps legalizing beer, selling liquor licenses and taxing the drink might provide the city with the cash it needed. It was a gutsy move because Prohibition had been repealed but Alabama and Russell County were dry. The state turned a blind eye, but for a time the Russell County authorities conducted half-hearted raids and confiscated the 3.2 beer the honky-tonks sold. Eventually the “wets” won out, but it was a case of be careful what you wish for. Phenix City started down a slippery slope. If 3.2 beer was OK, then full-strength alcohol must be OK, too. Soon it was beer, wine, and whiskey. Then came the racketeers who brought gambling and prostitution for the soldiers at nearby Fort Benning. The city itself was addicted to vice. A 1955 article about Phenix City reported that 20 percent of the city’s general fund was made up of income from licenses, fines, and forfeitures. Dirty money in the city coffers corrupted the city officials and soon the gangsters were running things, influencing city hall and infiltrating the police department with bribes and threats. Phenix City had been a haven for crime almost since its incorporation in the early 19th century. This is not to suggest that Phenix City was totally lawless. It wasn’t. It was only quasi-lawless. Certain roadhouses and brothels were periodically raided by police when payoffs were slow and when things really got out of hand the Military Police from Fort Benning would show up and roust the drunken soldiers on leave. Occasionally the military authorities would declare a particular joint off-limits to army personnel. The police department did its part, too. It revoked the permits for all the guns within city limits, but when it outlawed guns, only the outlaws had guns. There were attempts by a few brave locals to try and clean things up, but as might be expected, these were easily put down by threats and violence. Most of the time people just held their noses as they raked in the cash. The corruption of Phenix City spread beyond its borders. The city was a safe haven for bootleggers who imported tax-free liquor into Georgia and when confronted by Georgia revenue agents, scurried back across the border to the protective enclave of the city. There, the Georgia agents had no jurisdiction, and they could expect no assistance from either the Russell County Sheriff’s Department, led by Sheriff Ralph Matthews, or the city police. Prostitutes were available for the asking, with prices ranging from $5 to $50, according to testimony at one of the many trials held after the fall of the rackets. Plainclothes state troopers admitted “talking with” the prostitutes — and paying for that privilege. Spiraling out of control almost since its inception, with destruction accelerated by the gangsterism of the early 20th century, Phenix City hit bottom on June 18, 1954. On that night, a killer gunned down the town’s leading anti-vice advocate, Albert Patterson, in cold blood. A former state senator and Purple Heart veteran of the First World War, Patterson, 59, had been more than just a thorn in the side of the local hoodlums. Through the Russell Betterment Association Patterson had raised awareness of the situation in Phenix City and brought it to the attention of the people of Alabama. The Phenix City machine fought back against the RBA. Someone firebombed the house of the Association president, destroying it while his wife and children were inside. They barely escaped. After the police revoked the gun permits, two RBA members were assaulted with lead pipes by a pair of thugs. Patterson’s law office mysteriously went up in flames. Patterson, who could only walk with the help of a cane because of his war wound, was no saint. For a long time he was one of those citizens who gave more-than-tacit approval by working with the corrupt system of Phenix City on legal matters. Unlike those who colluded for the sake of profit, Patterson claimed he did so because of his belief in the rule of law — even for those who did not follow it and seemingly didn’t deserve it. Eventually Patterson could no longer in good conscience provide legal services for the criminals of Phenix City and he was recruited by the Russell Betterment Association to run for state Attorney General. The RBA knew that it would take state muscle to make any significant headway in the city. The May 4, 1954 primary in Phenix City was typically corrupt. Vote buying and tampering was common. People who openly supported Patterson were beaten and chased away from the polls without voting. But Phenix City was only one part of Alabama and when the votes were tallied Albert Patterson won the three-man primary by 70,000 votes. Unfortunately for him that victory only meant a runoff vote a month later against the candidate actually chosen by the machine. In the June runoff Patterson won by less than 1,000 votes. The slim margin necessitated a recount which gave the opposition a last chance to manipulate the totals. When that failed, the racketeers of Phenix City and the entrenched political machine of Alabama state government tossed away the ballots and chose the bullet. 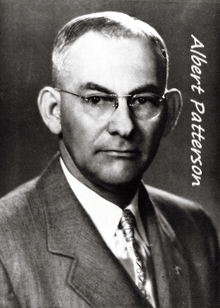 The Alabama political cabal did everything it could to defeat Patterson, but in June 1954 Patterson won the Democratic nomination for Attorney General. At the time winning the Democratic primary in Alabama was essentially the same as winning the general election, so the leaders of Phenix City’s underworld realized they had a significant problem. On the night of June 18, 1954, Patterson had just finished some work at his office in Phenix City and was getting into his car when he was shot three times with a .38 pistol. One of the shots was fired while the muzzle of the pistol was pressed against his lips. Patterson stumbled out of the parking lot on to a nearby street about 30 feet from where he was shot before collapsing and dying. Despite occurring on a relatively busy street not far from the gambling houses — and just outside the office of the county Solicitor Arch Ferrell, an arch-nemesis — the sheriff’s investigation revealed that no one heard or saw a thing. The killer escaped easily. Patterson knew that he was playing for the highest stakes possible and that his life was in danger. He declined to carry a gun because he said any attack on him would be ambush-style and he would not have a chance to return fire. Just the day before he died Patterson gave a speech in Phenix City where he expressed his feelings about his future. “I believe I have only one chance out of a hundred of being sworn in,” he told a crowd of supporters. Suspicion quickly fell on the racketeers who stood to lose the most should Patterson take office. The murder had all the earmarks of a standard mob hit, and while Patterson was not the Democratic machine candidate, his only enemies appeared to be the mobsters running Phenix City. Immediately after Patterson’s murder, Governor Gordon Persons called out the Alabama National Guard and imposed limited martial law in Phenix City. The Pentagon declared the city off-limits to all military personnel from Fort Benning. Along with sub-machine gun-toting state troopers, 150 Guardsmen with law enforcement background began patrolling the city streets as the governor announced a $5,000 reward for information leading to the arrest of Patterson’s killer. Local police were disarmed by the Guard, the only time in American history this had happened. Patterson’s son, also an attorney, swore vengeance on the murderer. The National Guard did more than just patrol the streets in place of the police. Shortly after setting up camp, the Guard began raiding gambling dens and whorehouses, making dozens of arrests. Patterson’s murder and the arrival of the National Guard was too much for some honest residents of Phenix City, however. Foster resigned his job, packed up his belongings, and left the city forever. Solicitor Arch Ferrell, who had once been Patterson’s partner but was known as the house counsel for the racketeers, expressed shock and dismay at the murder. Sheriff Ralph Mathews, meanwhile, ordered a roundup of “all known criminals” in hopes of finding some clue to the murderer. He appointed his chief deputy, Albert Fuller, to oversee that operation. Within days of the murder, however, the probe took a singular turn. Ferrell and Mathews were removed from the investigation, and Alabama Attorney General Si Garrett announced that he was leaving Alabama for Texas for “reasons of health.” Garrett checked into a Houston sanitarium for a mental breakdown. The Alabama Supreme Court replaced the local judge — who was not implicated in any wrongdoing — and demanded the resignation of the local jury commissioners who were responsible for selecting venirmen for trials. The Court expressed confidence in the judge, but said replacing him would help restore trust in the judicial system. The jury commissioners, however, did not enjoy the same confidence. The Court hinted that all was not kosher with Russell County’s jury selection process, ordering a purging of the jury rolls and a new pool selected. It turns out that before he left the state Si Garrett spent 10 uncomfortable hours testifying before a special grand jury looking into the vote fraud that had occurred during the primary race for Attorney General. At the same time, Ferrell and Mathews were subpoenaed by the panel to testify about their roles in the voter fraud. Patterson himself had received a subpoena to testify about what he knew of the matter. Investigators looking at Albert Patterson’s murder were working under an entirely new theory of the crime. It wasn’t racketeers who killed the self-proclaimed “Man Against Crime,” it was politicians. In reality, it is unusual for organized crime to plot an assassination of a law enforcer, no matter how much of a firebrand that person is. After all it is better to let investigators try to make a case rather than hand them one on a platter. The same mindset likely applied to mobsters from New York who had ultimate say over Phenix City (Since the income was $20 million annually, the Syndicate in New York was doubtless heavily involved in operations, and it was smart enough not to kill an Attorney General-elect). The lack of mob convictions in connection with Patterson’s murder shows this was a rogue operation by a group of desperate men. Two weeks after Patterson’s death, Si Garrett, Arch Ferrell, and Lamar Reid were indicted on vote fraud charges. Reid was the chairman of the Jefferson County Democratic Executive Committee and had taken part in the shifting of votes from Patterson to his opponent. The murder investigators began looking at Arch Ferrell’s activities around the time Albert Patterson was killed. Ferrell was in his office not far from the murder scene but told investigators that he did not hear anything. At the time of the murder Ferrell was on the telephone with Silas Garrett, he said. Investigators located a cab driver who swore he saw Ferrell and Chief Deputy Sheriff Albert Fuller near Patterson’s car shortly before the murder. Another witness was willing to testify that he saw Fuller and Patterson walking toward Patterson’s car together and that he heard shots fired shortly after. This evidence contradicted that of the initial investigation that no one heard or saw anything related to the crime. Equally damning, the witness was ready to swear that he saw Fuller running away from the scene after the killing with another man — Arch Ferrell. Fuller denied any connection with the murder and said that he was working in the sheriff’s office when Patterson was killed. He didn’t know anything of the murder until he was informed by another deputy, he said. Investigators were undeterred by the alibis presented by Ferrell and Fuller. A subsequent search of Fuller’s home revealed .38 bullets made by the same manufacturer as those that killed Patterson. The circumstantial evidence pointing toward the prosecutor and deputy sheriff was sufficient to lead to indictments. In December 1954, Arch Ferrell, Albert Fuller, and Silas Garrett were each charged with the first degree murder of Albert Patterson. Garrett was served with his warrant while still a patient in the mental hospital in Texas. Ferrell was also laid up by a serious back injury and was arrested in his bed and placed under house arrest. Fuller was hale and hearty and jailed. Fuller was the first to go to trial. After 26 days of trial and 6 hours of deliberation, the jury returned a guilty verdict. The prosecution wanted to send Fuller to the chair, but instead he was given a life sentence. Protesting his innocence, Fuller was taken to prison where he served 10 years before being paroled. Ferrell went on trial next and was acquitted. The circumstantial evidence against him just was not strong enough to merit conviction, the jurors said. Garrett was judged mentally incompetent and was never tried for his role in the murder of Albert L. Patterson. He died a broken man. The grand jury looking into the activities of Phenix City returned 740 indictments ranging from murder to vagrancy in the four months it was impaneled. Most of the crimes were minor, but about 400 people would eventually go to jail or pay a fine for their participation in the vice operations in the town. Patterson’s son, John, took his father’s place on the ballot in 1954 and was elected Attorney General. In 1958 he was elected Governor of Alabama. A strict segregationist, he banned any marching bands from African-American high schools from participating in the festivities surrounding his inauguration.